Henline's "conservatively, at least 10,000" translates to "conservatively, at least" a couple of hundred thousand, in actuality. See the math here. Henline may really have no idea, or maybe she simply didn't want to say so. But the DoJ does have an idea, and has been made to answer the question. 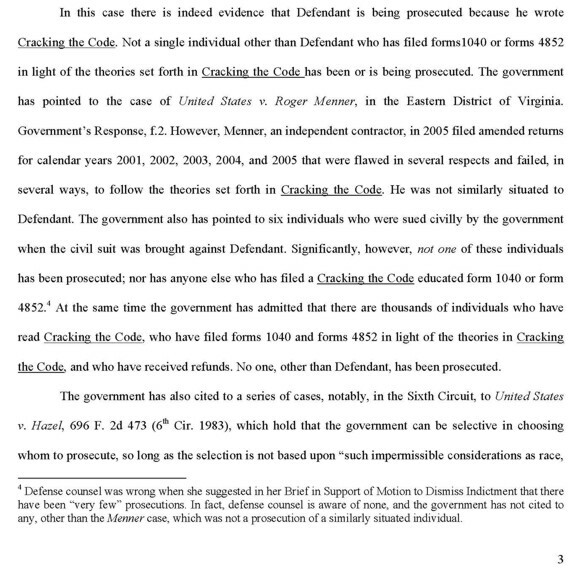 So, in 2009, six years after CtC-educated filings began and all those refunds started going out week after week, month after month, year after year-- scores of thousands of them-- Roger Menner’s prosecution was the only thing the DoJ could offer to suggest that anyone else has EVER been prosecuted over CtC-educated filings (and only "anecdotally"-- a weasel-word meant to protect the attorney from charges of outright lying to the court, I suspect). By the way, this write-up concerning the Menner case is that of my attorney at the time. Here is my own far more comprehensive discussion of this case, posted as a newsletter item in late summer of 2008, along with the indictment. LET'S LOOK AT ANOTHER CASE that some in the troll community have misrepresented as being a prosecution over CtC-educated filings. This one is a beaut. The fellow WAS prosecuted for "false filings", but only for his pre-CtC filings. His actual CtC-educated filings, which were made after his errant ones but well before he was charged for those older filings, were carefully omitted from the extensive list of charges, and from the plea bargain deal he was eventually offered. Here's the story: Eugene Warner was indicted in November of 2007 on a long list of charges, amongst which are a couple alleging the filing of false tax returns. See the indictment here. Warner's allegedly false returns were all filed on or before August 29, 2003-- which was only 6 days after the first printing of the book came back to me from the printer and long before the first copy ever left my hands. Plainly, these were NOT CtC-educated returns. However, subsequently, Warner DID become CtC-educated, and filed a number of new, educated returns-- some of which were for the same years as these false ones, by the way. Warner's educated filings resulted in at least three victories (scroll down this page to see them for yourself). Despite the fact that Warner's CtC-educated filings were nearly two years old at the time of this indictment, and had been posted on this site about the same amount of time, those filings go unmentioned in his indictment. A year-and-a-half later, in March of 2009, a superseding indictment was issued Eugene in which 11 counts of "fraudulent refund claims" under a Title 18 statute were added to the charges against Eugene. Several of these new charges appear to have been intended to suggest to the casual reader that Eugene was going to be prosecuted over his educated filings after all (though the fact that the charges involved Title 18 offenses rather than Title 26 offenses says otherwise). But whatever the intent in adding on these new charges, the feds promptly abandoned it and negotiated for a plea of only one conspiracy count, to which none of those gratuitous add-on charges (nor anything else not pre-dating Warner's reading CtC) was related. Think about this. Let it sink in. Like the Menner case which the DoJ's Washington HQ Tax Division lawyers lamely offered as the best thing they could come up with as a supposed prosecution of someone over CtC-educated filings, a complete package of the facts involved in Eugene Warner's case proves that CtC-educated filings are NOT prosecuted. THERE HAVE BEEN A COUPLE OF OTHER CASES LIKE ROGER MENNER'S over the years since 2009, involving filings which were imagined to be CtC-educated returns or which were subsequently compromised. As in the Menner case, the distinguishing details of these couple of events (in contrast to the hundreds of thousands of untroubled actual CtC-educated filings for well over a decade now) emphasize the reality that there are no actual prosecutions for actual educated filings. For instance, a fellow named Greg Boyd was indicted in 2013 and convicted on charges of filing three returns he didn't really believe to be true-- for 2004, 2005 and 2006. His later identical returns prompted no charges. Boyd's returns were meant, it would appear, to be educated filings. But Boyd actually left the 1099 MISCs with which payments made to him were reported unanswered-- instead of rebutting the 1099s, Boyd filed completely irrelevant 4852s somehow thinking that would do the trick (4852s are relevant to only one kind of 1099-- the 1099-R). In addition, Boyd also had a long history of bankruptcies and past filing oddities, such as erratically disputing IRS claims against him or agreeing to pay them, and more. This government filing in the case will give some idea of that history. All of this combined to create a good basis for Boyd being charged with not really believing-- or even knowing-- what he said on the returns for which he was charged, and for having actually meant them as some form of evasion. The icing on the sour cake Boyd had baked for himself was his repudiation of the charged returns, and his 2012 return declaring all his earnings to be "income", done while under indictment. His "defense" in trial was to stipulate that his charged returns were incorrect and to owing taxes for those years, and to claim to having been in the grip of misunderstandings when filing them-- but he's feeling much better now. Unsurprisingly, Boyd was convicted on all counts. There is also the recent indictment of James Back. Back is charged with not really believing what he said on three educated returns, and also with not filing at all for the next three years. Back had secured complete refunds for his three years of educated filings. Unfortunately, he then got spooked-- probably from listening to trolls-- and stopped filing, despite withholdings and W-2 allegations identical to those of the earlier years continuing to be made. At the same time, he filed, in at least one of those years, some kind of fake form described as a "Form W-0". This latter failure-to-file behavior-- agreeing by silence to allegations about payments of exactly the same character as those he had deemed false on his educated returns-- and his resort to the use of some kind of fake form, contradicted Back's earlier filings. This made a perfect case that Back really hadn't believed what he said on those filed returns. After five years of these damning contradicting indicators, Back was indicted for filing false returns (that is, returns he didn't really believe to be correct) and for failure to file. In October of 2014, Back was convicted after apparently offering no real defense to the charges, and instead merely telling the jury "taxation was immoral and unfair, and that he simply refused to submit to it anymore," and "that there is no evidence that state or federal laws apply to him," according to a newspaper reporting on his conviction. Boyd's and Back's cases are just like Menner's and Warner's. They are each distinguished by key elements which make them NOT cases in which anyone was simply charged with a crime for filing CtC-educated returns. The main point of rebutting and shining light on the misrepresentations used to try to discourage the CtC-educated (and to frighten away those not yet educated) is not to argue that doing what's right is always "safe". It is, rather, to counter the subtler ploy behind these lies: a "resort to authority" fallacy suggesting that CtC must be wrong about the law, else there would be no adverse behavior by our noble prosecutors and judges and other civil servants. The absurdity of the proposition that the beneficiaries of the "ignorance tax" and their appointees and agents would attempt no concerted and occasionally even corrupt efforts to suppress a truth fatal to their comforts, luxuries, power and position is pretty-much self-evident, I trust. Everyone at above-room-temperature-status knows that even though they may be only a minority, there are nonetheless plenty of corrupt people in positions of power who WILL attempt to fool others in defense of their gravy-train, and some of whom will even defy the law in such efforts to the extent that they believe they can safely do so. Indeed, we've just seen one explicit example of official corruption in service to an effort to suppress CtC-- the misrepresentation to a federal court by a US attorney about the Roger Menner case. If you read through the posts here, here and here, you'll see a series of such misrepresentations by a US attorney made on paper, over signature, in a filing to a court by way of the government's "response" to my motion to vacate the conviction from the exercise in sustained corruption to which I have been subjected. My prosecution itself makes clear that officials will not just lie, but will do much worse when they believe they will get away with it. Read about some of the more egregious kangaroo-hops undertaken in that mugging here (and be sure to not miss the appellate court's backdoor admissions of the illegitimacy of my conviction in response to my Motion to Vacate, which you'll find toward the end of that documented discussion). The take-away, then, for this discussion of misrepresentations about prosecutions and all that follows, is not that bad things can't or won't ever happen in connection with doing the right thing. It is, rather, that representations by those seeking to oppose and suppress the plain truths revealed in CtC are not to be taken as true on their face in a direct sense, and not at all in their intended implication that opposition to CtC by powerful interests invested in the status quo is evidence against the correctness of its revelations. On the contrary, the behavior of officials seeking to resist or discourage those acting in the light of CtC is simply more evidence of its correctness, and never more plainly so than in misrepresentations of facts such as those discussed here. That's the real message of everything presented by the trolls-- it simply requires a little reading between the lines with one's thinking-cap in place.